Please complete the form below and your enquiry will be sent directly to Our Favourite Things Market via email. Your enquiry has been sent to Our Favourite Things Market. These are a few of our favourite things: beautifully crafted artisanal products, fresh local produce and passionate foodies, all coming together in a friendly, happy, special atmosphere. We’re celebrating these things at our seventh annual special evening market in December 2016, where we will have more than 40 passionate stallholders that make, bake, source, curate, sew, collect, and are just all round creatively fabulous. Bring the whole family – there is always something for everyone. On Friday, 16 December 2016, the market kicks of at 5pm and stallholders will be ready to welcome friends and guests with their crafts, delicacies, and fresh produce until 9pm. Guests will be able to buy tickets (R100 per person) to reserve a table by sending an email to Nicolene. 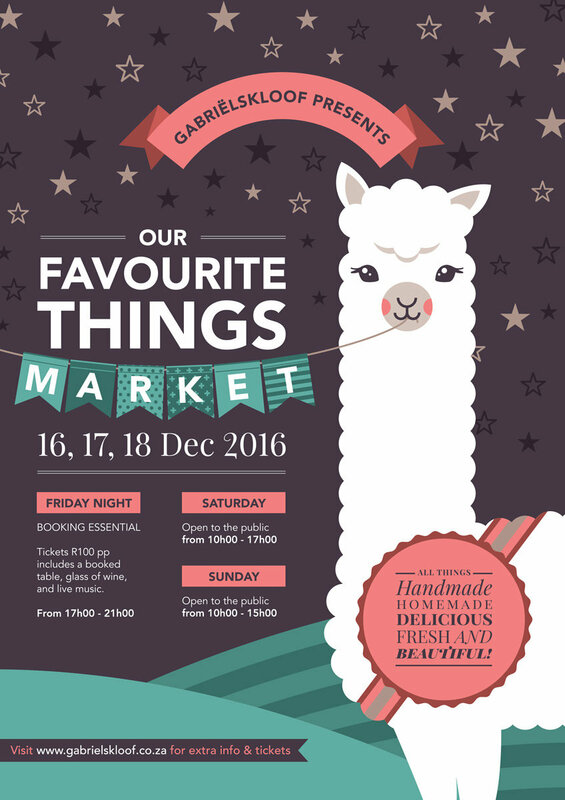 We repeat all the magic on Saturday 17 December 2016, when the market starts at 10am and finishes around 5pm, and this year, for the first time…. we will have the market open on Sunday from 10am to 3pm.